Disney Channel has produced a handful of iconic movie musicals over the years, and now the next generation of stars is taking the reins with the Descendants franchise. The film, which centers around the children of classic Disney heroes and villains, first premiered in 2015 to rave reviews and was eventually followed up with an equally successful sequel in 2017. While past DCOMs have failed to amount to the same success as The Cheetah Girls and High School Musical, the Descendants franchise has risen to the occasion with its catchy numbers and original storytelling, which is in large part due to director and choreographer Kenny Ortega. Now, the franchise is taking things up a notch with the release of Descendants 3 this Summer. 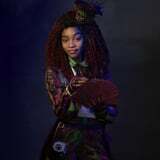 While all the original characters - or villain kids as the fandom calls them - will be back in action, there will also be a few new faces in the mix, including newcomer Jadah Marie as Celia, the daughter of Dr. Facilier from The Princess and the Frog. Ahead of the release of the new trailer on Disney Channel this Friday, I had a chance to talk with the 13-year-old about joining the franchise, getting into character, and becoming part of the Disney family. POPSUGAR: You were previously on the show Mann and Wife, but this is really your first starring movie role. What made you get into acting? Jadah Marie: Well, I started [acting] because of my dad. My dad is an actor, Christian Redd, and I just love what he has done from the "Jesus Walks" video [by Kanye West] to working with Snoop Dogg. I was at a meeting with him and his agent, and I was doing the absolute most, and he was like, "Well, how about your daughter? Is she into anything?" And he was like, "I mean, we can try it if she likes it," and I ended up loving it. PS: What was your first reaction when you found out you would be in Descendants 3? Were you already a fan of the franchise? "Growing up loving the franchise to being in the franchise is a dream come true." JM: Oh, yes. I knew all the songs. "Chillin' Like a Villain" is still my favorite song to this day. When I got the news that I was going to be in Descendants, I was with my sister and my best friend, Olivia, and I just started screaming and crying because growing up loving the franchise to being in the franchise is insane to think about. It's still a dream come true to this day. PS: What was the audition process like? JM: It was amazing. I got to see a lot of my friends on the way, because when you're an actress, you see a lot of people that you know [from] auditions. Honestly, I went into the character. I had a whole week. I had the outfit ready. I knew I was going to be Celia because I could just feel it. PS: How was your first day on set? Were you nervous at all? JM: I was more excited than nervous. I was probably too excited to even think about being nervous because I just wanted to go to dance rehearsal. I just wanted to meet all of [the cast]. I just wanted to be all of their best friends. PS: Who do you think that you bonded with most on set? JM: I bonded with all of them, honestly. We all bonded super quick. But I would probably say Anna [Cathcart] because she's close to my age. We would always hang and go to Daiso, our favorite store in Canada. PS: What did you do to prepare for your role or get into character? JM: Celia kind of reminded me of one of my friends, Olivia. Actually, [during auditions] her name was Olivia. [She also reminded me of] me because Celia is a daddy's girl, which I am too. She's very mischievous, she's very charismatic, she's very streetwise, and she's very funny. She's hilarious, as you will see in the movie. She will crack you up. But she's just an awesome person, honestly, and I feel like I relate to her so much. PS: At the end of Descendants 2, the kids of the Isle of the Lost were kind of separated into two groups, those siding with Mal and those siding with Uma. What side is Celia on? JM: Celia is very mischievous. In the Isle of the Lost, you do trust people, but I feel like Celia is the kind of person who doesn't pick sides. She loves all people. She's just about the green and girl power. PS: POPSUGAR had the first look at Celia's costume, which is incredible. What was the inspiration for the look? Were there different iterations of it at first? JM: Kara Saun, the costume designer, she made up a whole thing called tribal punk, and honestly, when I just saw the whole outfit, I was in awe. All of her work is amazing, and I love everything that she does. From Mal's outfit to Celia's to Hades's, it's so amazing. You could see the similarities, but also the differences for Celia. On the side, she has a little trusty sidekick, her little own voodoo doll, like her dad. On her top hat, there's a skull and there's patterns and there's bright colors. And the scene "Friends on the Other Side" - all those colors are on her outfit. PS: Jamal Sims plays your father, and he's also the film's choreographer alongside Kenny Ortega. Did you two hit off right away during filming? JM: Oh my gosh. Jamal is just the best. Working with him was awesome. He's so nice. When we were rehearsing [our dances], everyone was screaming, and I was like, 'Why is everyone screaming?' And they were like, 'We just found who is going to play your dad.' And I was like, 'Oh my gosh. Where is he? Where is he?' And I saw Jamal and was like, 'Helloooo.' And I gave him a big hug. I'll always remember that. That was the best moment ever. PS: Kenny Ortega has directed so many iconic Disney films over the years like The Cheetah Girls 2 and High School Musical. What was it like getting to meet him and work with him? JM: High School Musical was literally my favorite thing in the whole world. Me and my sister would always watch all the movies. So getting to work with Kenny was like a dream come true because he is a king, he's a legend. He's basically everyone's dad because everyone has known him for so long. He's a great person. He was always my number one person to go to [on set] and his passion is awesome. He was always there for everyone. PS: Is there a specific scene from the film or a specific number that you're really excited for fans to see? JM: All of it. All of it. As a Descendants fan at heart, I feel like everyone's going to love it because I loved it. It's all new, it's bigger, it's better. PS: How different will this film be from the past two? JM: It will be different from the past two because [there will be] all new dancing, all new fashion, and a whole new journey. And all the new songs, everything it's going to be bigger.